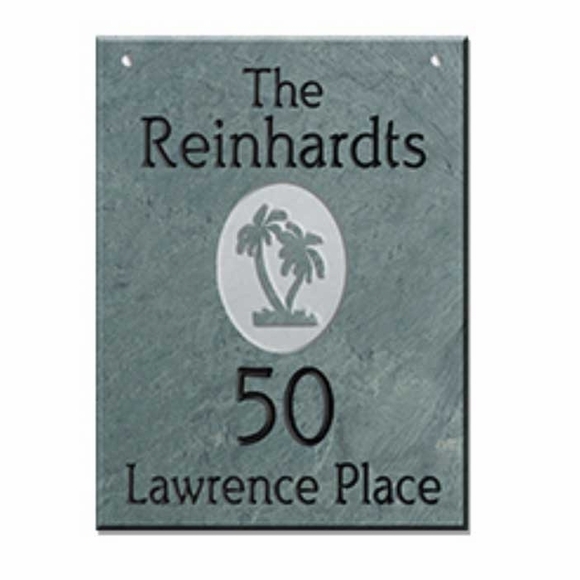 Hanging Address Plaque with Palm Trees - - slate address sign. Tropical theme plaque features two palm trees in the center. Personalized with the family name, house number, and street name you supply. Made in USA. The one-sided sign has the name & address you supply and the palm trees on the front only. The two-sided sign has the name & address you supply and the palm trees on the front and the back. (Note: personalization is exactly the same on both sides). Vertical orientation with four lines of text and two palm trees in the center of the sign. If you are not using Line 1, leave the input box empty. Hang on a post close to the road for excellent roadside visibility. Greet visitors with a warm southern welcome.